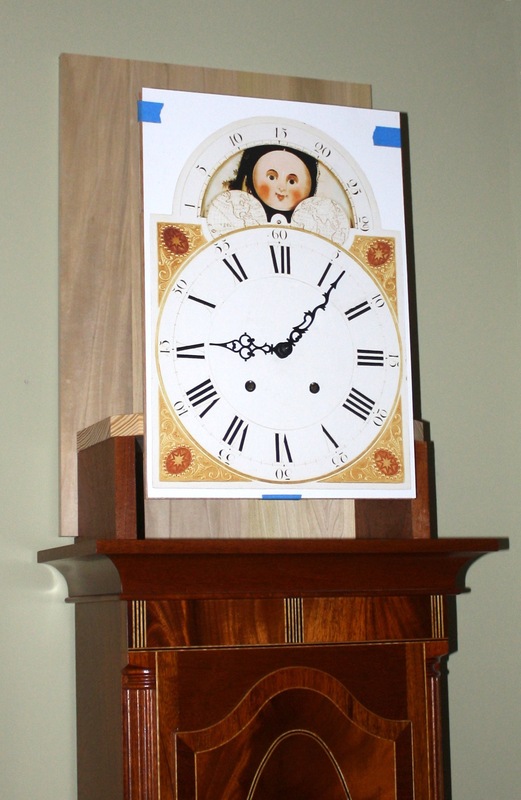 If you’ve followed this blog for anytime at all, you know I’ve been working on two tall case clocks. I’m happy to say that one of the clocks is done. Mine! Why is the clock I built for me complete and the other for a customer not yet finished? The answer is two-fold. If you watched any of the episodes of the New Yankee Workshop, Norm always built a prototype. Even though I was building two clock simultaneously, I worked out the details on the clock I was building for myself before moving to the customer’s clock. (Believe me, there were quite a few adjustments along the way.) As a result, their clock is much better. I experimented on inlay, door design and most recently on how to best position the hood door; it took two attempts to get the location right. The second reason my clock is complete while the customers languishes on is due to the clock dial pan. 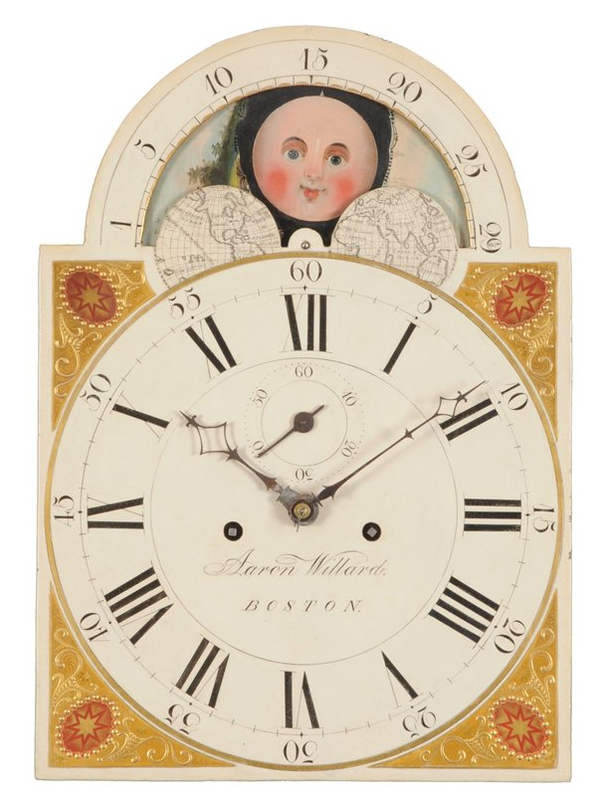 Many of these antique clocks had hand-painted dials. We’d talked about the dial many times, but it wasn’t until recently that final decisions were made as to what would be painted. With a decision made and the painter contacted, the customer’s dial should be completed in November. I, on the other hand, have not yet determined what I’d like to have painted on my dial. So how did I get my clock finished? I cheated. Once the dial was loaded, I went in and stripped the interior of the image out using PhotoShop – I’m not overly experienced with this program, but I squeeze by. I pulled the interior out because I have a movement complete with hands that I want to use, so there was no need for the hands. Also, don’t have a sweep second hand (the miniature dial just below the XII) although those are very cool in antique clocks. 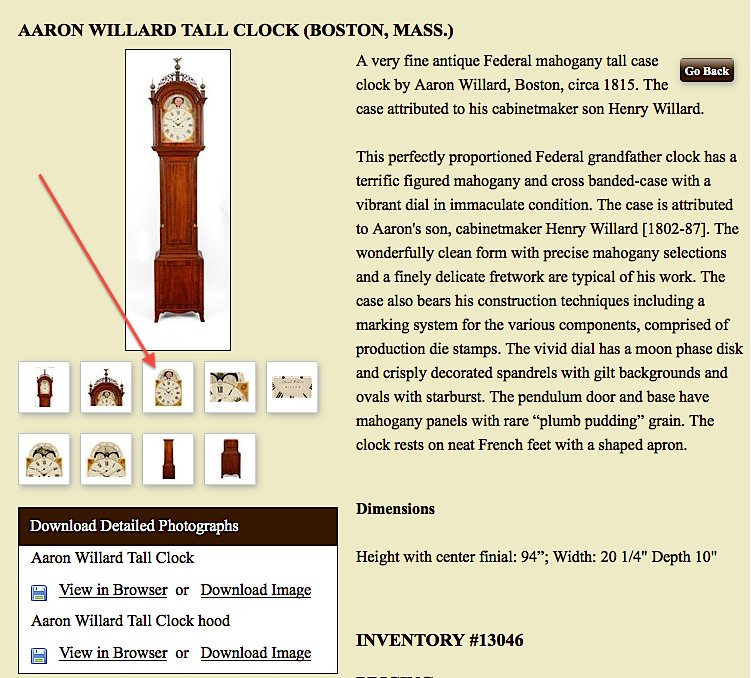 Lastly, I didn’t want my clock signed by Aaron Willard from Boston (not that I wouldn’t be thrilled to own such a clock). With those steps complete, I manipulated the image to match the dial pan size and hit the print button. And in case you think I’m pulling one over on you, below is a photo of my clock with the hood off. When I figure out the painting for the dial, I’ll make the change. But until then my paper cheat is going to work fine.